The Philippines offers an incredible opportunity to play a valuable role in addressing the issue of sanitation. 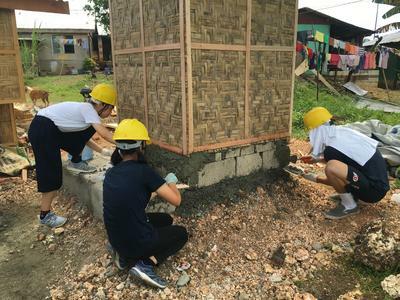 With more than 3000 homes in the Municipality of San Remigio lacking sanitary toilet facilities, our groups focus on constructing toilet facilities for homes and communities to address local health issues and community concerns. 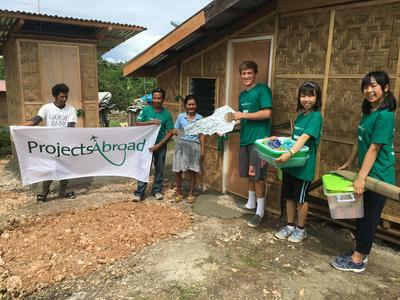 Our volunteers work to help construct toilet blocks for communities and homes around the Municipality of San Remigio and in Bogo City. Groups will work alongside local builders and tradesmen to learn local construction methods.They will teach you all the necessary building skills needed to take part in this project. All of this work is supervised by our Projects Abroad Building Manager to ensure that every toilet facility is built to a high standard and will fit it's purpose for many years to come. If your group would prefer to help with the construction of schools and homes, this can also be arranged. Our work in Bogo City and in the municipality of San Remigio follows on from our previous Disaster Rehabilitation Project which concluded in August 2016. This focused on areas in the northern part of the Cebu Island where a total of 874 classrooms were destroyed by Typhoon Haiyan in 2013, according to the Department of Education. Our groups aided in the reconstruction of schools and homes following this devastating storm. On Cebu Island the beaches in the north and southwest offer the classic combination of white sand and clear seas with spectacular diving or snorkelling. It really is a beautiful country with an abundance of attractions to see and explore.